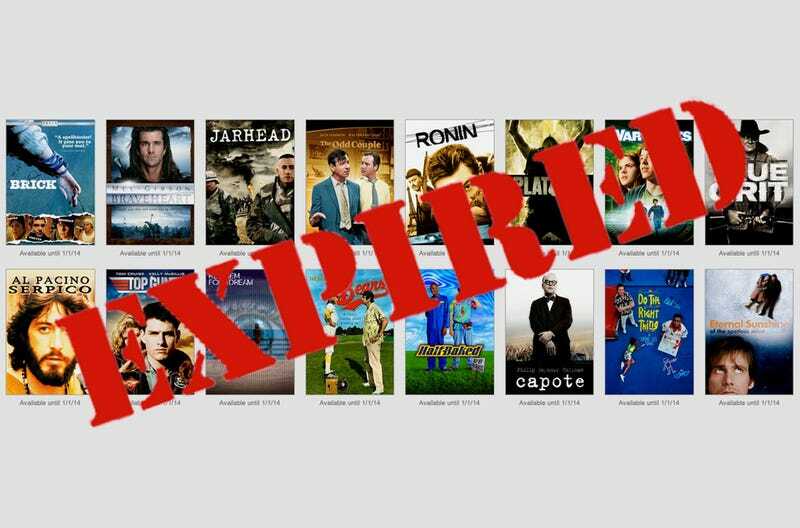 When the clock strikes its last midnight in 2013—or somewhere around there, anyway—dozens of movies will disappear from Netflix streaming. Fortunately, you've still got some time to churn through the ones you'll miss the most. Here's a list of the very best of the movies that'll be gone in 2014. While Netflix has made it much harder to find out when movies expire, some Reddit sleuths have picked out an extensive crop of chopping-block titles. You can see the date the license is up yourself by adding them to your queue. Remember that just because they're going now doesn't mean they're never coming back. But with a precious few hours between now and when they're gone, why take that chance? You can head here for a fuller reckoning of what's on the way out; it's entirely possible you care more about losing Troll 2 than Top Gun. In the meantime, start hoping that these are about to be replaced by a fresh crop of content in 2014—and start your streaming marathon now.